NB: (1) countefeited on Psycho (9) 1988 (SC). (1) counterfeited on CD in the U.K. (Beat ) 1995 with seven bonus tracks. There have also been a few retrospective compilations:- Vapeur Mauve (Eva 12029) 1983; Return From The Grave (Voxx VXM 200.012) 1983 and I'm Just Gonna Blow My Little Mind To Bits (Voxx VXM 200.013) 1983. 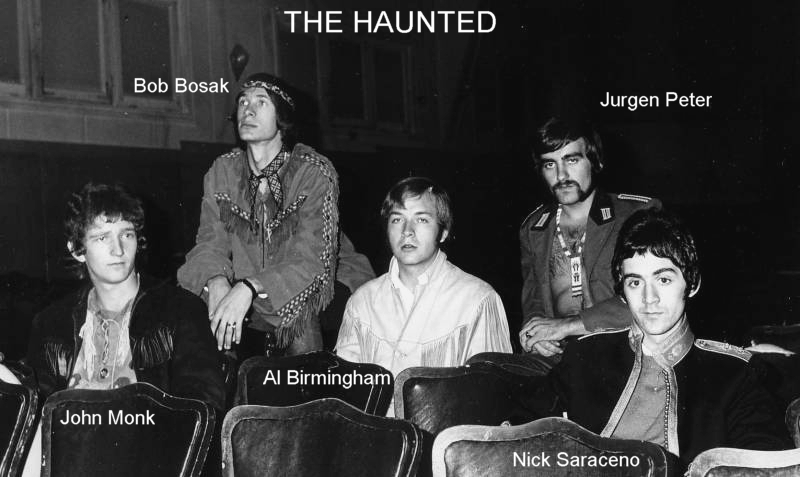 Both Voxx albums have also appeared on one CD The Haunted (Voxx VCD 2012). NB: (6) recorded 1967. There's also a French only 45, Vapeur Mauve/Pourquoi (Marque XII 7001) 1968. Only the 'A' side features The Haunted (a French language version of Purple Haze, with the 'B' side being by Sean Bonniwell's Music Machine. Jurgen Peter:- "In Canada, in the early '60s, there was no such thing as a commercial music industry. The DJ's played only American records and it was common knowledge that they lived off "payola" from the record companies. When we, The Haunted, started to play as a band in the Montreal area, there was no way to get a recording contract, no one to play your records, no booking agency to book us, no large shows and paying gigs to play at, no music magazine or anything like it to promote a local band." "I had to scout out large halls and skating arenas and rent them from the local communities for a Friday night show/dance. Then I went to the local school commission and rented six or seven school busses for that night in order to 'import' our home based Fan Club. I soon found out that if you hired the local DJ to be the master of ceremonies at your show, and gave him a percentage of the gate, he would plug that show all week long without having to buy airtime at a ridiculous price, and if you did have a record, he would actually play it on the air. With the explosion and dominance of the British bands Canada wanted to follow suit and soon the local record companies and radio stations smelled money and latched on to the bands that had the most following." "I also realized that I needed a 'vehicle' that would promote The Haunted so I got together with one of our Montreal DJ Dave Boxer from CFCF. (He later brought The Beatles into Canada) and formed and incorporated both a bi-weekly music paper ('Music Trend') and a booking agency (Groups And Sound Service aka GASS.) After a successful show, the public wanted to come back the following week and it gave me an opportunity to book some of the other local bands." In 1965, David Wynne joined from The Rabble, swapping places with Brian Robillard. David:- "I played with The Haunted at the Montreal Forum when we won a Battle of the Bands competition. The prize was a recording session where we cut 1-2-5. Afterwards, Mason left and Michel St German of Les Sinners was hired temporarily to fill-in. Other bands in the competition included David Clayton-Thomas, The Shays and Les Classels etc." Their first 45, the garage classic 1-2-5 was a hit in Canada in April 1966 and was subsequently released in the U.S.A., Australia and some European countries. 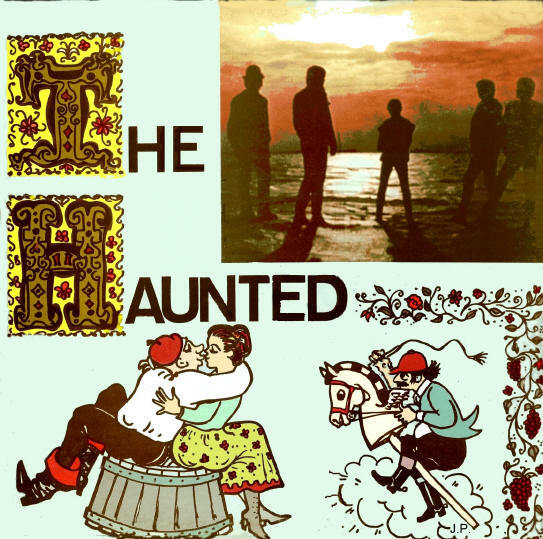 On early pressings the group's name was erroneously spelt as The Hunted. Co-written by Burgess and Peter, the 'A' side was a garage punk effort noticeable for its harmonica. The flip was another relatively catchy punk rocker. 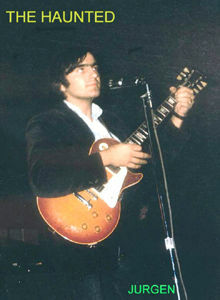 Shortly after recording the second 45, David Wynne, left the band. (Though soon afterwards he joined Influence.) A new Haunted line-up (E) came into place, but after the release of, I Can Only Give You Everything which was in a similar style to 1-2-5 and also a minor hit, they left Quality Records for Trans-World. Burgess left too after a row with Peter. The album included their first and third singles, cover versions of Sam Cooke's Shake and Jagger-Richards' Out Of Time, a self-penned psycho-punk number, Horror Show, as well as some blues (St Louis Blues), Arthur Lee's A Message To Pretty and a couple of other offerings. Good as it sounded it was not The Haunted at their best. Jurgen Peter:- "By that time The Haunted had avalanched into fame and money. Our fan club was organized with thousands of members. We were on TV almost weekly, and our 45's were playing on most of the radio stations." The fourth single was similarly mis-credited production-wise, but was relatively weak and made little impact on the charts. Land Of Make Believe, issued in May 1968, was a self-penned Hendrix-influenced acid-blues number. 1968 also saw the release of the 45 on Jet to coincide with the documentary about the group. This is a very sought-after single. Apparently Burgess wrote the 'B' side in ten minutes whilst the rest of the band were recording the 'A' side. It was recorded in New York at the same time as the band's second single. Jurgen Peter:- "At the end of 1968, Dave Boxer and myself dissolved both Musix Trend and GASS as it was no loger needed and I was just overwhelmed with my own band business at the same time playing and recording. At that time already we couldn't go anywhere without being cornered for autographs or photos." "We were the most sought after and highest paid Canadian band for many years. When I folded the band in 1971, I had to cancel a whole year of advance bookings and it cost me a fortune in lawyer's fees to get out of some of them." You can also seek out the band on various compilations, Eight O'Clock In The Morning has resurfaced on I Was A Teenage Caveman, 1-2-5 can be heard on Pebbles, Vol. 1, Get Primitive (The Best Of Pebbles) and both the 45 and LP version of this classic grace Songs We Taught The Fuzztones. Vapeaur Mauve can be found on Pebbles, Box Set. Finally, their cover of Message To Pretty graces Sixties Rebellion, Vol. 8: Love Covers. The best and most accessible source for this seminal outfit's released material is via Greg Shaw's Rough Diamonds series on Voxx. Two volumes, Return From The Grave (Voxx VXM 200.012) 1983 and I'm Just Gonna Blow My Little Mind To Bits (Voxx VXM 200.013) 1983 come complete with a comprehensive (but distorted) history and include unreleased material as well as the tracks recorded by Burgess' Our Generation. Heartily recommended. There's also a CD Haunted (Voxx VCD 2011) 199?, combining both the Voxx albums on one CD. Today, Al Birmingham lives in Delta B.C., Jurgen Peter in Richmond, B.C. and Bob Burgess in Stittsville, Ont. Jurgen Peter, is still trying to set The Haunted's story straight:- "Last month I was at a record collectors convention and bought a 45 by The Haunted on Continental Records (Searching For My Baby (Continental PD 9280)). The 45 was produced and released in South Africa by Hank Squires!! It just blows me away how things can get out of hand in time!" Send mail to thehaunted@telus.net with questions or comments about this web site.